This type of hotels provides more facilities and services. Rooms have attached bathrooms and others. Prices for a night here is higher than that of the budget options which would usually start from RM100 per night. As a top tourist destination is home to some of the top resorts and international hotel chains from across the world. These options are a lot more expensive than others where you can be assured of the best services and world-class facilities. They are usually used by business travelers and for those who prefer to stay indoors more as Melaka is a place to really go out and get around. Some come with in-house facilities while others provide you with great facilities within the room you stay in. Prices here would usually be from RM300 and above. We would strongly recommend staying in Imperial Heritage Hotel not far from Hatten. This is a hotel in which you can find everything you need while it does not cost too much. 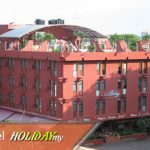 It is quite a new hotel which means you will like the modernity about it while you are within walking distance to attractions, shopping malls and a lot of good food too. Besides that, there are antique shops and a lot of souvenirs to buy here as well. Another major location around here is Dataran Pahlawan which is a stone’s throw from Jonker Street. Take some time to bask in the historical era of Malacca here. Equatorial Hotel is not far from here while our top pick would be the Imperial Heritage Hotel.